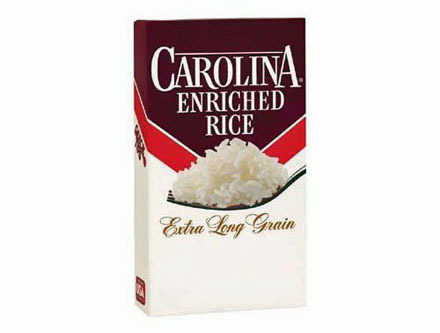 Carolina Long Grain Enriched Rice is the fluffy long grain rice. A family favorite that is delicious and convenient. Carolina rice is naturally sodium free, cholesterol free and fat free. Bring 2 cups of water to a roiling boil, adding salt to taste. Stir in 1 cup of rice; cover. Reduce heat and simmer for 20 minutes or until water is absorbed.